One of the latest rages in RC is the funfly 3D type of plane. These planes are capable of doing all sorts of extreme maneuvers such as walls, harriers, knife edge loops, knife edge spins, waterfalls and of course hovering to mention just a few. Great Planes latest addition to this very exciting area of RC is the U-CAN-DO-3D. While some may think this to be an unusual name it in fact tells all about what this plane is about in those 4 little words. The U-CAN-DO-3D is capable of performing these extreme types of 3D flying and it also makes it rather easy to do for the less experienced pilots. The fuselage has a generous profile and the tail moments are generous. Couple this with a thick airfoil, lots of wing area, low wing loading and huge control surfaces and you have one outstanding 3D fun fly plane! I received my U-CAN-DO and was very excited to get started on the assembly. 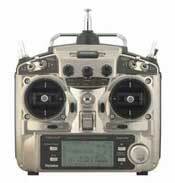 This is an ARF model so only the final assembly is required such as hinging, radio & motor installation. 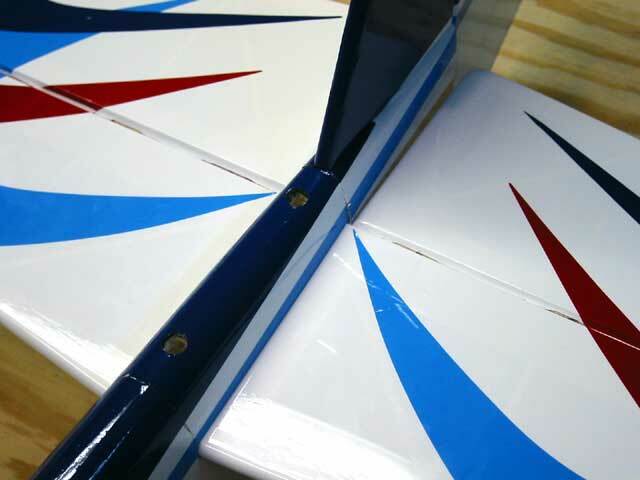 All the structure of the model comes prebuilt and covered in Top Flite Monokote with a sharp looking red, white and blue on the top while the bottom of the wing has red & white checkerboards. Ok…it’s time to get started with the assembly process and then off to the field to fly the U-CAN-DO-3D! Wing is 1lb 13 oz. Wing bolts, control horns, clevises. LEFT: The parts complete as they come out of the box! As with any kit or ARF the first step is to unpack everything carefully. In the above image to the left you can see all the pieces included along with accessories exactly as they come out of the box. The fuselage, wing, tail feathers & control surfaces are all prebuilt and covered. The fiberglass cowl and wheel pants are pre painted. The instruction manual provided is extremely well done. Step by step pictures through each phase of assembly are provided with clear written instructions. The instruction manual was a “hit” in my opinion. Click here to read the manual. The U-CAN-DO’s wings come prejoined so it’s not necessary to even join the wings! So what’s left to finish up the wing you ask? Not very much so let’s get started. First step is to glue in the provided wing dowels. 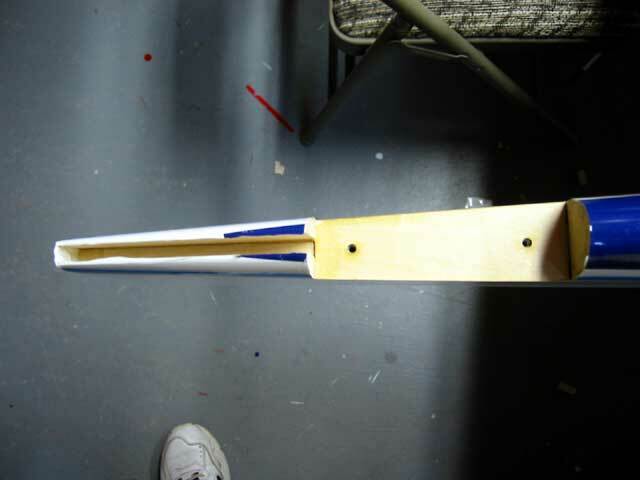 I cut the covering to reveal the predrilled holes in the leading edge of the wing and used some Titebond wood glue to glue in both dowels. The manual is so good it not only tells you to CA the hinges but gives you the proper technique and details for doing so. To those who are unfamiliar with CA hinges this is very helpful. Included in the kit is one CA hinge strip which is 2″x9″ and you must cut out eight 3/4″ x 1″ [19 x 25mm] hinges from the strip. This is easily done with an exacto or razor blade. Once the strips were cut the I followed the directions outlined in the instruction manual to glue all the hinges in place. The next step is to mount the aileron servos, pushrods and control horns. I cut the covering away from the precut hole in the wing where the servos will be placed. 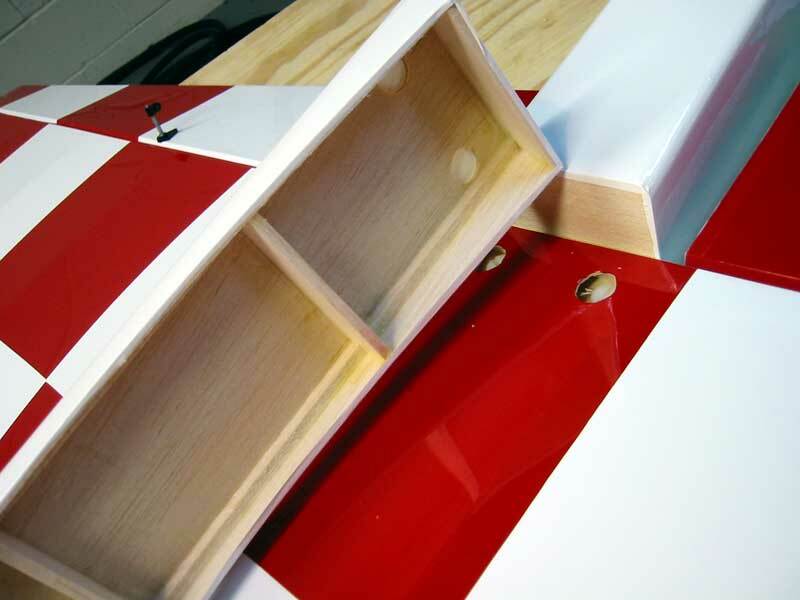 In the photo above to the right you can see the cutout waiting for the aileron servo. String is threaded through the wing so you can easily tie onto the servo wire and pull through to the center. Note the heat shrink tubing over the servo extension. Next I installed the control horns and pushrods. 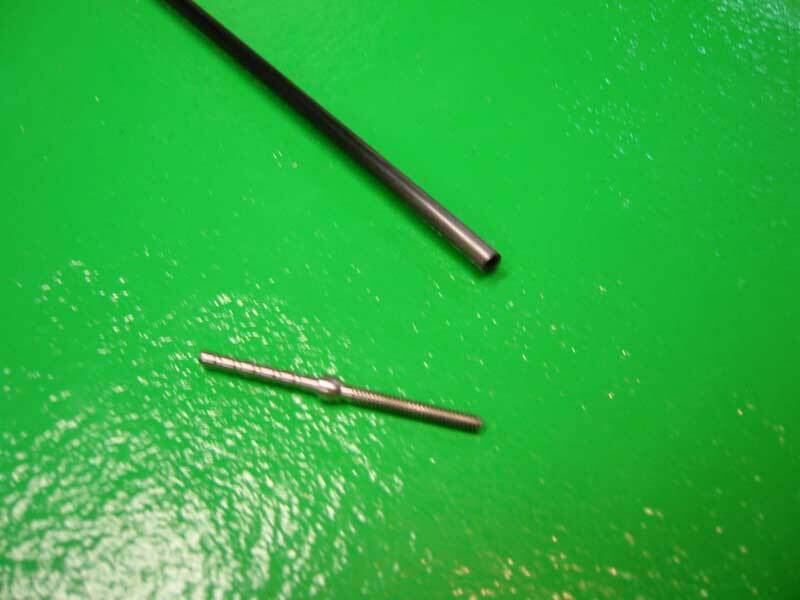 Provided with the kit are metal 2-56 pushrods & plastic clevis’s. With the large ailerons and fairly long length of the run from servo output arm to control horn I decided to use some carbon fiber pushrods with titanium ends. For the connectors I chose Dubro’s Heavy Duty Clevis with keepers. I had always heard about carbon fiber pushrods but never actually used them so this was a good chance for me to test them out and write about them for other readers who might not have tried them yet. The carbon fiber pushrods & titanium ends are extremely light, strong and rigid and readily available from Art’s Hobby which is where I obtained mine from. This pushrod setup would guarantee there would be no bending or play possible during high stress maneuvers. The 2-56 might be sufficient but I felt more comfortable with this setup or one could simply use 4-40 rods if not comfortable with the 2-56. Assembly of the CF (carbon fiber) rods is simple. Just cut to length and then glue the fitting which has “barbs” on one end and threads on the other into the CF rod. The fit is perfect. The barbed end goes into the rod with either JB Weld or 30 minute epoxy. Once dry install the clevis of your choice. The completed setup is shown in the picture above and to the right. It’s easy, fast and very strong! To complete the assembly of the wing I glued the belly pan on with some 5 minute epoxy. First I bolted the wing onto the fuselage and then lined up the belly pan with some glue on the bottom of it. 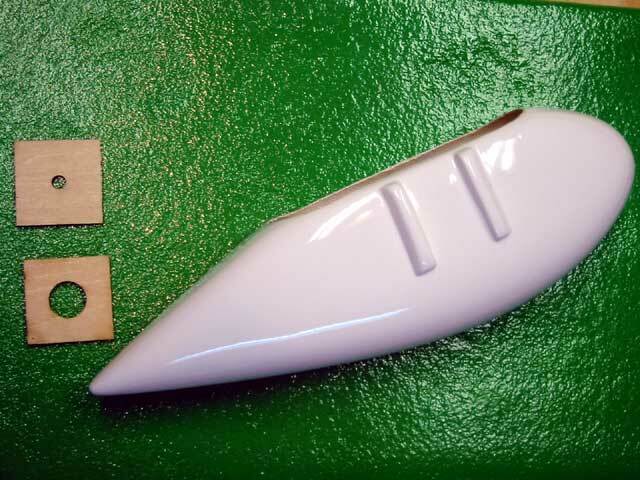 Once the glue had set I used some masking tape on each side of the bellypan between the wing and the fuse so I could lay down a filet of 5 minute epoxy to both seal & strengthen the bond. After smoothing the filet with the end of a popsicle stick I quickly removed the tape before the epoxy began to set. Belly Pan gets glued to the bottom of wing with 5 minute epoxy. That completes the assembly of the wing so we are onto the fuselage! Assembly of the fuselage on the U-CAN-DO-3D begins with the tail feathers. First I cut the covering to release the stab hold down block. 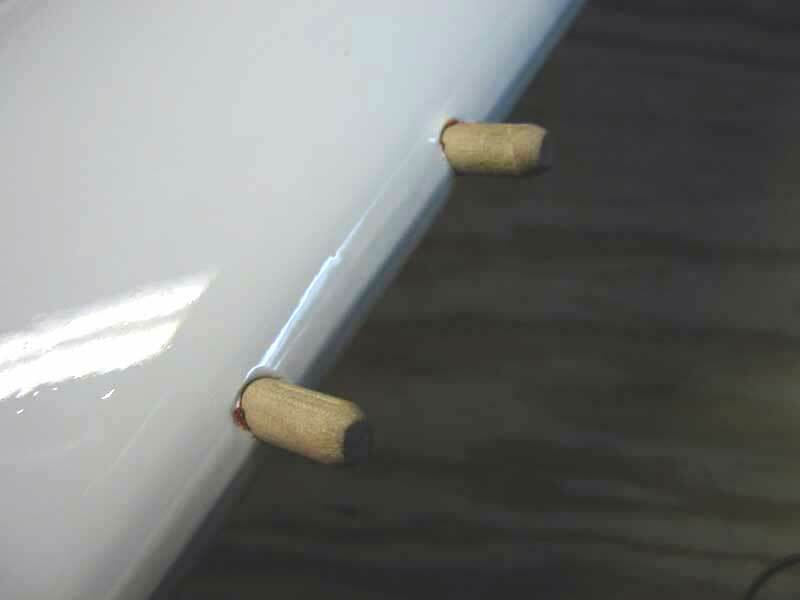 I stripped away the covering from the rudder as needed using a soldering iron so I would not score the wood which will weaken it. I then applied epoxy to the fin in and glued it into the slot. Before the glue was set I checked to be sure the surfaces were properly aligned. Once I was satisfied with the alignment I cleaned off the excess epoxy with some alcohol. 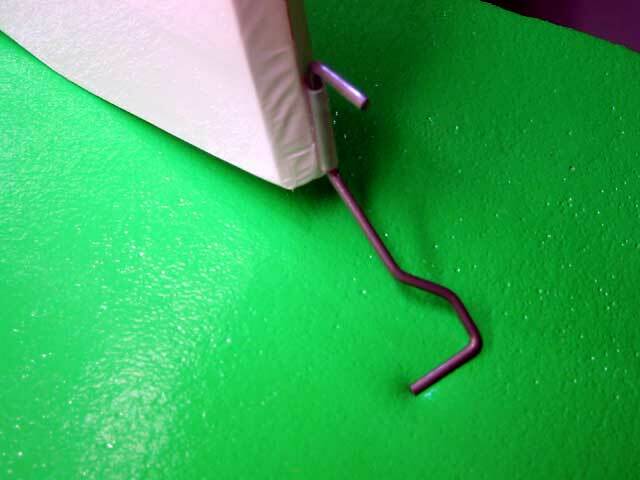 The horizontal stab is then bolted on with the supplied hex screws. 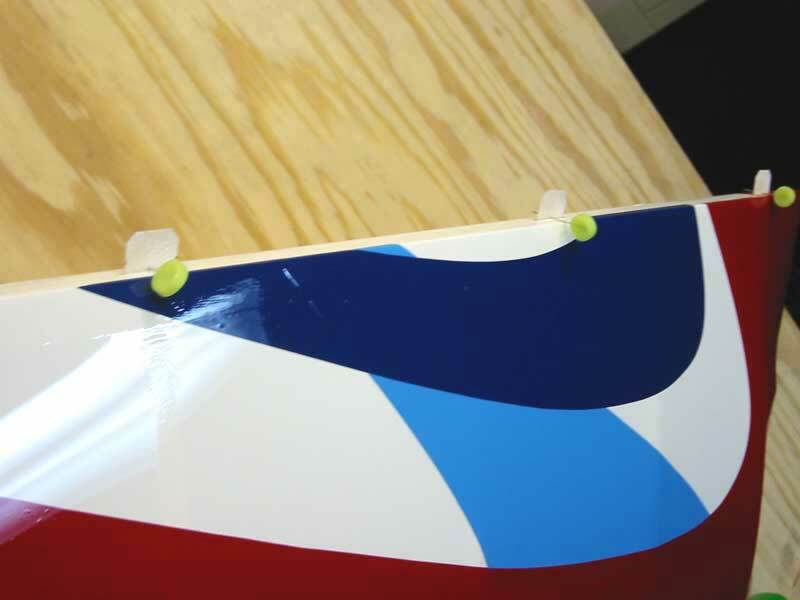 Control surfaces are attached using CA hinges. Finally the tail wheel is glued into the rear of the fuselage and the tail wheel & retaining collar installed. 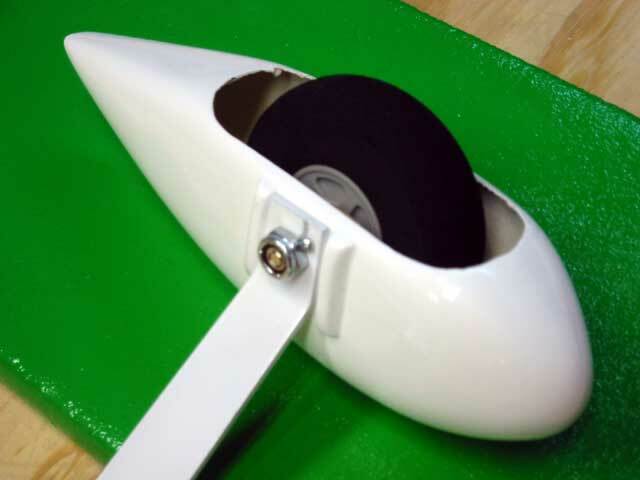 The wheel pants come pre-painted and are constructed of a solid fiberglass material. The assembly is straightforward and results in a strong assembly. 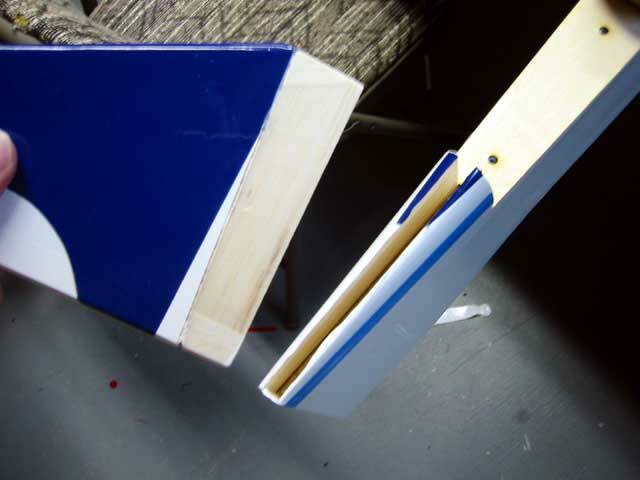 First I laminated the 2 pieces of plywood with some Great Planes thin CA glue to create one thicker piece which has the large hole on one side. I then cut a 1/2″ hole in the wheel pant to accommodate the shaft and glued the laminated piece of wood into the wheel pant so the holes lined up. I then drilled 2 holes into the wheel pant and through the aluminum landing gear to accommodate the small sheet metal screws which keep the pants from rotating and secure it to the gear itself. I then assembled the entire pants assembly on both sides to the aluminum landing gear and bolted the entire assembly to the fuselage with the supplied screws. The manufacturer recommends this motor be run on fuel containing 5% to 15% nitromethane and oil content at a minimum of 18%. I chose to use Wildcat Fuel with 15% nitro and 18% synthetic oil as I’ve found it runs extremely well in all my motors and especially the 4 strokes. 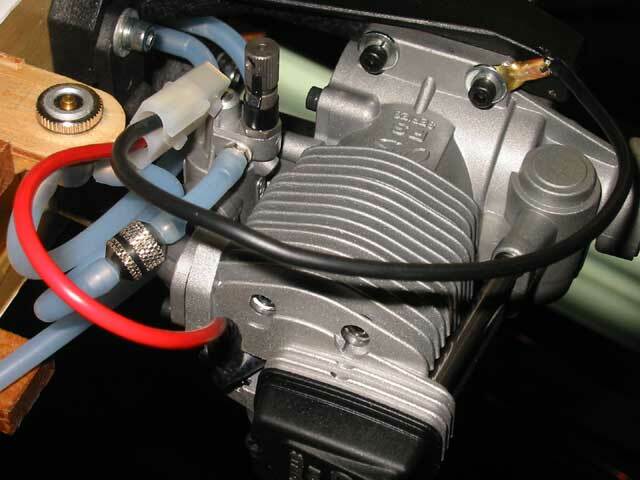 The synthetic oil helps to keep the 4 stroke cleaner while castor can gum them up over time. 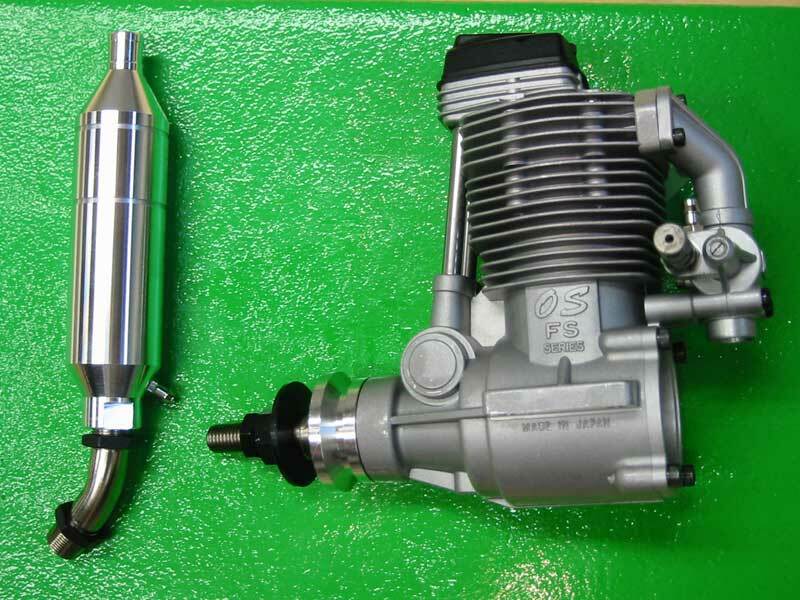 One of the advantages of the 4 stroke motors are fuel economy. 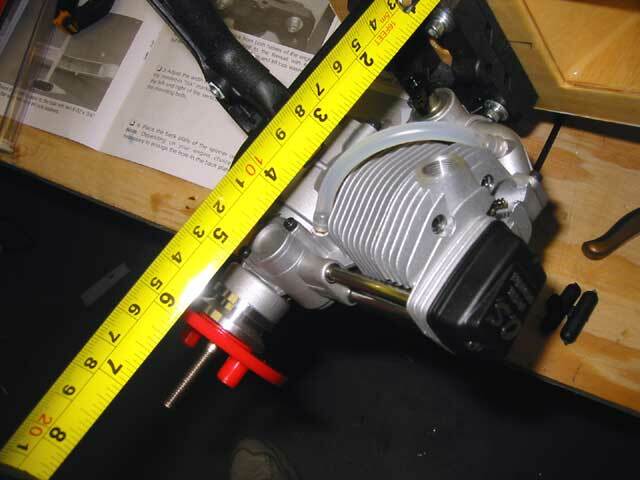 With the supplied fuel tank in the U-CAN-DO-3D flight times with this motor should be in the 10-18 minute range depending more on throttle usage for the longer time quoted. 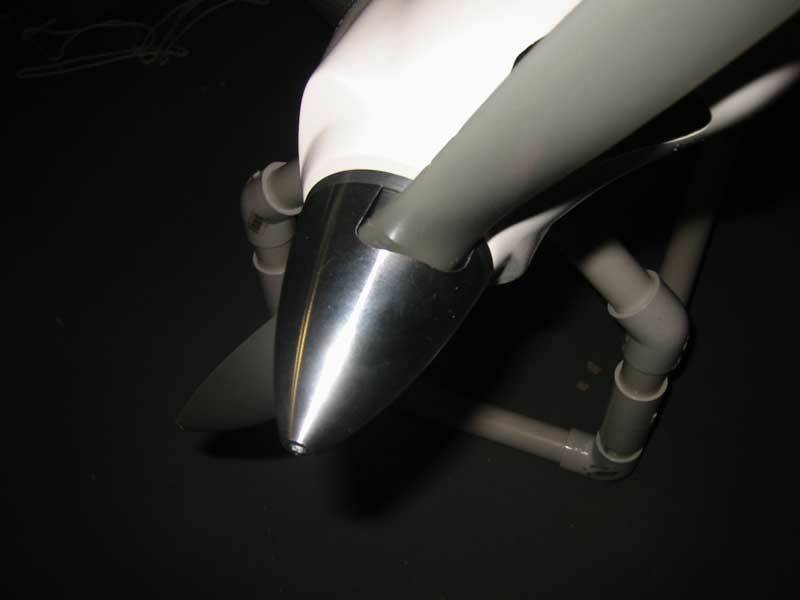 Other advantages are that they are quieter, have more torque and can swing a larger prop. Of course they also have a cool sound. 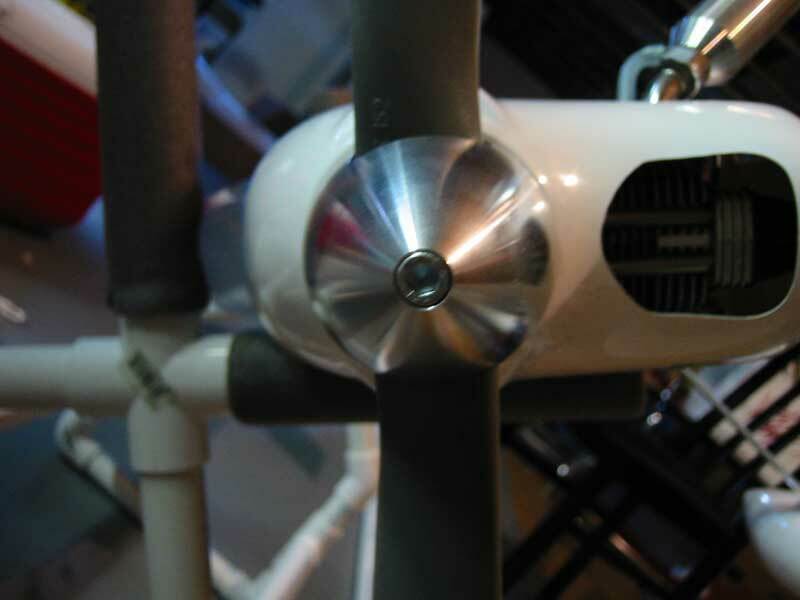 Per the recommendation in the manual I used a 15×6 prop to get “matched” performance from the motor/plane combo. This version II of the OS 91 sports more power than its former model and comes with a full 2 year warranty from OS. Performance on mine was excellent. It ran right out of the box and started on the 3rd flip by hand! Plenty of power and I have still not fully broken this motor in. It starts right up without the need for an electric starter & I found it very user friendly to setup & adjust. 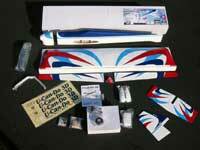 It makes a great combination with the U-CAN-DO-3D or any other plane which requires a powerful & reliable .91 size four stroke. 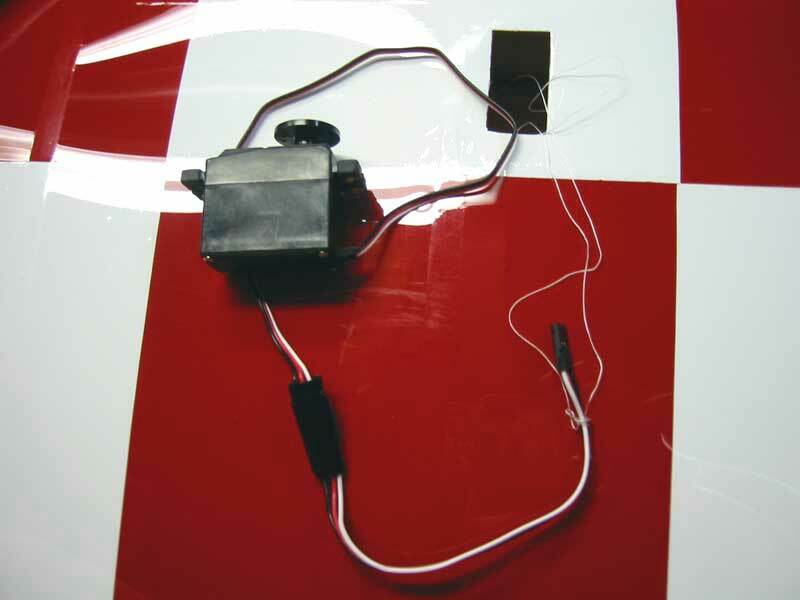 Pictured above is the Kavan Deluxe Remote Glow Plug Igniter. 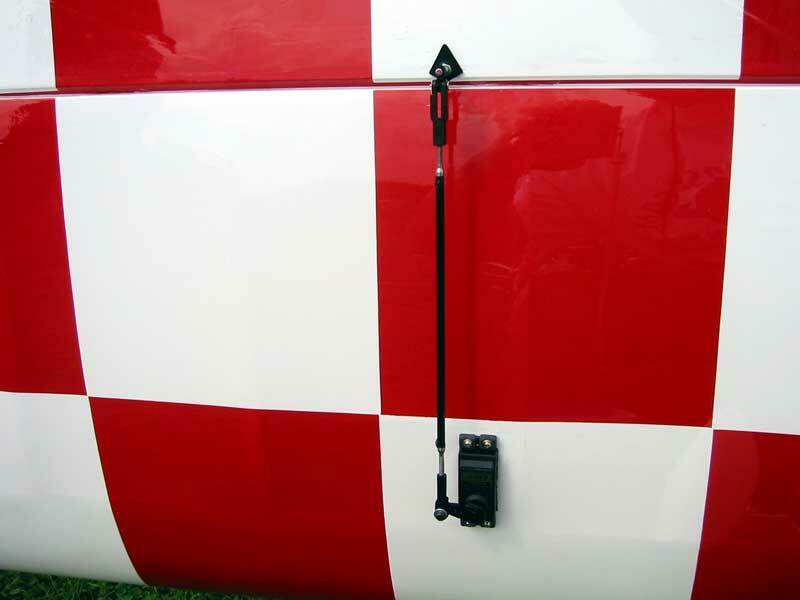 This allows you to simply attach your glow igniter to the connector on the outside of the cowl which is very convenient, easy to use and sharp looking. Without a remote igniter a larger hole would need to be cut in the cowl and attaching the igniter is difficult on inverted motors. 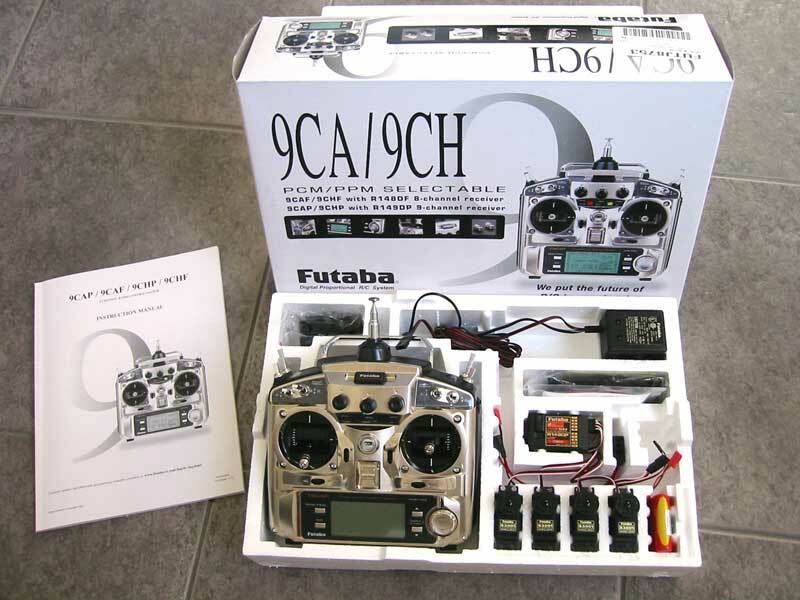 The Futaba 9CAP system consists of the Futaba 9C Transmitter, a FP-R149DP Micro RX (Dual Conversion), four S3001 servos, switch, nicads & charger. WRING IT OUT FLIGHTS. TIME FOR 3D! After the maiden I inspected the aircraft and all the linkages as I always do with new aircraft. All looked ok so I fueled her up for flights number 2,3 and 4 of the day. These flights weren’t as tame as the maiden! I still had the motor running well on the rich side but decided to see what the U-CAN-DO-3D could do. First I went for a hover. A short bit of background though on my hovering capability. Prior to this day I had only been able to hover 2 of my planes for 5-10 seconds at best until they fell out or I lost orientation. The UCD is sold as a plane where us “normal” pilots can push the 3D envelope. Well it’s not just marketing jargon. I had the plane hovering for 25-40 seconds with about 1/3 the effort it took me on my other planes. The OS motor hovered the plane at a little over half throttle even at the rich setting. The plane is very stable in the hover and easy to correct when it tries to fall out. Very amazing. Also, it will not rocket out of the hover but will pull out of it well with the OS FS-90. I plan to test 2 other props and lean the motor for peak rpm after break-in to see how much faster I can get pull out from a hover as this motor is still very new & being run rich. Next I tried some tight loops with the flaperons mixed into the elevator. Loops both inside and outside were extremely tight as in the nose chasing the tail. There was no tendency for the plane to snap out of it. Video footage of this is at the bottom of this section. I tested the ailevator mix next but could not see a difference when they were activated. I’m not sure what maneuvers where ailevators would come into play but would be curious to find out still. I then tested some high rate rolls which are extremely fast. Slow speed flight is just awesome. I activated the flaps and put them down and pointed her in the wind at 1/8th throttle or a little under and this plane basically stood motionless in the air for as long as I wanted it to at just a slight nose up attitude. Video footage of this is at the bottom of this section. Inverted flight required only a touch of down elevator. I tried to stall the U-CAN-DO-3D but found it practically impossible to do so. I held the nose up and chopped the throttle but the plane just keeps flying. If you can get it to stall the recovery is so fast it’s hard to tell you stalled. A lot of confidence is inspired as this plane has so many good tendencies and very few bad ones. One tendency the aircraft did exhibit though that some will want to be aware of or program out with their radio is the coupling on the rudder. In knife edge the plane was tucking toward the belly so I had to compensate for the coupling. This plane will do knife edge loops quite easily as well as high alpha knife edge fly by’s but you will have to compensate for some roll & pitch coupling either manually or by mixing it out. I was able to perform, using high rates, some wild lomcevaks and also spins. I was not able to get it to flat spin in my first 6 test flights but may have to push the CG back a little. I’ve heard of others who have done knife edge spins even with the U-CAN-DO3D! 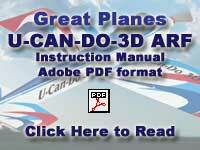 Great Planes has a smash hit with the U-CAN-DO-3D. This plane seems to garner attention both at the field from onlookers as well as in the RCU forums. At the time of this review the U-CAN-DO-3D thread is the #2 most viewed & replied to topic since RCU opened it’s doors. All these accolades are well deserved. The quality of the kit along with the outstanding 3D performance where even non expert pilots are made to look like expert pilots makes the U-CAN-DO-3D a big winner. Slow speed tendencies are outstanding and inspire confidence. The U-CAN-DO is going to be a tough act to follow. If you like aerobatic, 3D & fun fly planes get a hold of one of these planes right now and find out what the excitement is really all about. As their ad says “The name says it all”. Since the original review I’ve had more opportunity to fly the U-CAN-DO-3D. The flying characteristics and fun factor continue to get very high marks in my book. I however did not get enough good weather yet here in the north to test the plane out with a more rearward CG around 6″ back. Field reports say that this will increase the planes ability to perform some of the more advanced 3D maneuvers and cut down on some of the rudder coupling. I will try this in the spring and report on it. 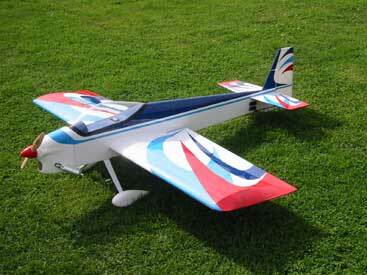 After numerous flights following the original review the aircraft has held up well without any issues. A few spots of covering wrinkled on the fuselage but that is common it seems with most of my aircraft sitting in my cold basement during the winter. An iron tightens it back up quite easily. I also put on an APC 15×6 prop onto the OS 90FS II motor after it was fully broken in. The prop, plane, motor combo seems to work very well and I’m going to stick with it. I could not find a 2 1/4″ spinner to accomodate the large APC prop so I turned to Tru-Turn to see if a custom cut spinner could be made. Fortunately the answer was yes! For those who are propping this plane with larger motors and props the Tru-Turn spinner was about the only thing I could find to fit a prop this large while being a small diameter cone. Since Tru-Turn is known for quality aluminum spinners I was ecstatic they could custom cut a spinner for my prop. Tru-Turn Spinner to the rescue!